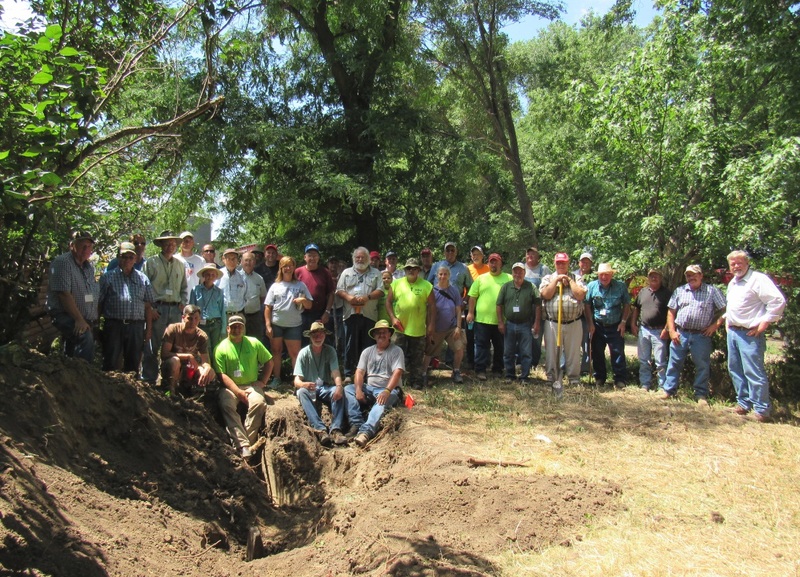 The Professional Surveyors Association of Nebraska held their 2017 summer seminar at St. Paul and Boelus, Nebraska, with over 30 in attendance. 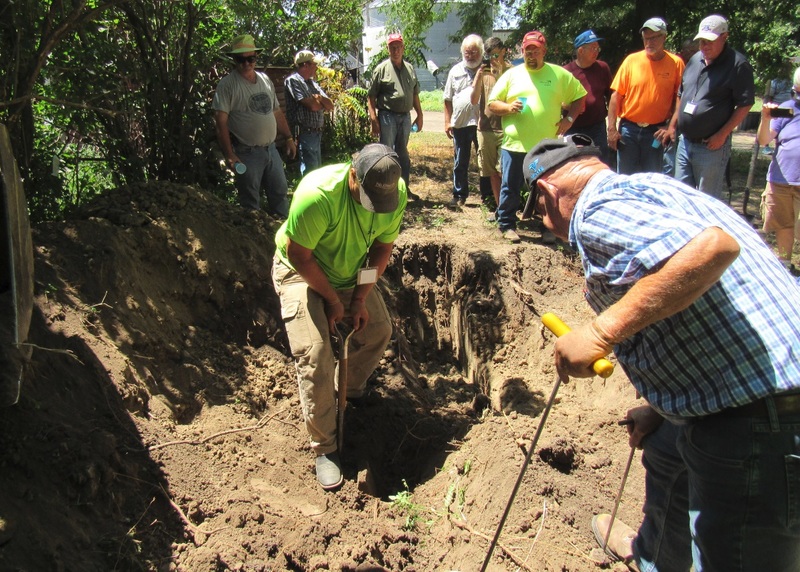 On Thursday, July 13, the group toured the Howard County Museum, the baseball museum, and then gathered at the St. Paul cemetery to view the grave sites of famed surveyors James N. Paul, Nicholas J. Paul, and Robert Harvey. The great-grandson of one of the Paul brothers, Butch Arterburn, gave a historical talk about the Paul family. The evening meal was then served at the Twin Loups restaurant in St. Paul where an excellent reenactment video was shown that portrayed the testimony taken by Robert Harvey from several people involving a disputed corner location. Friday morning, the group gathered for breakfast at the Boelus Civic Center. Tim Aitken and Jerry Penry gave a slide show on the lives of Robert Harvey, the Paul brothers, the North brothers, and several other surveyors key to that area of the state. 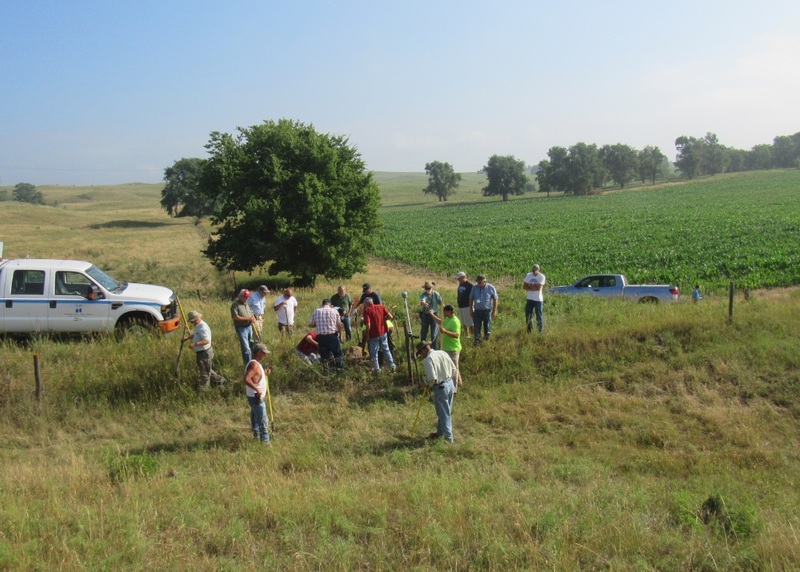 The attendees divided up into two groups to begin the field activities to search for lost corners along the Sherman/Howard County line. This 24-mile line should have been run as a straight meridian during the original survey, but the early monuments recovered by Harvey revealed that there were many significant deflections along the line. In 1893, Harvey began at the south end and ran his own true meridian the entire length and placed marked stones every three miles along his line while also tying in the original monuments. 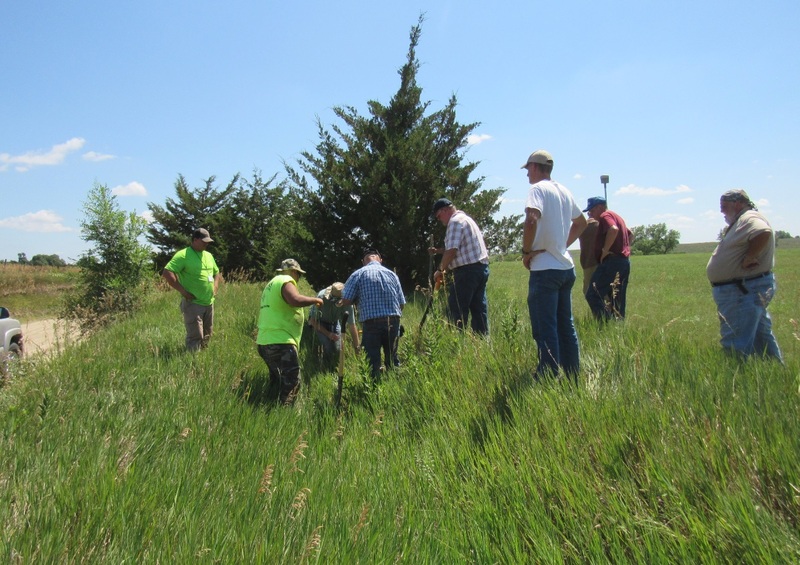 One group endeavored to find the starting point, or 0-Mile monument, which was the corner common to Sherman and Howard counties along the north line of Buffalo County. An old axel of unknown origin was recovered, however, calculations by Casey Sherlock placed the search area south of this location. 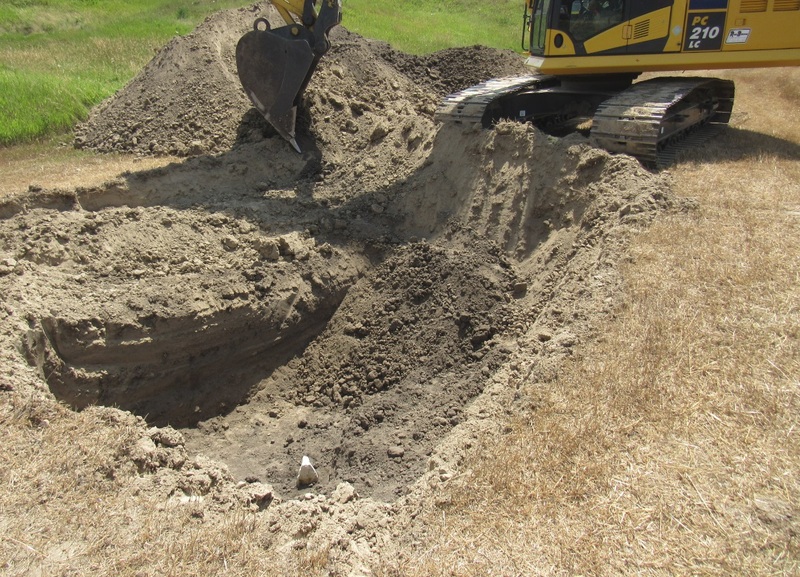 As shovels scraped away the soil, the outline of a large circular area of discoloration was found that was most likely the bottom area of where Harvey had dug his hole. 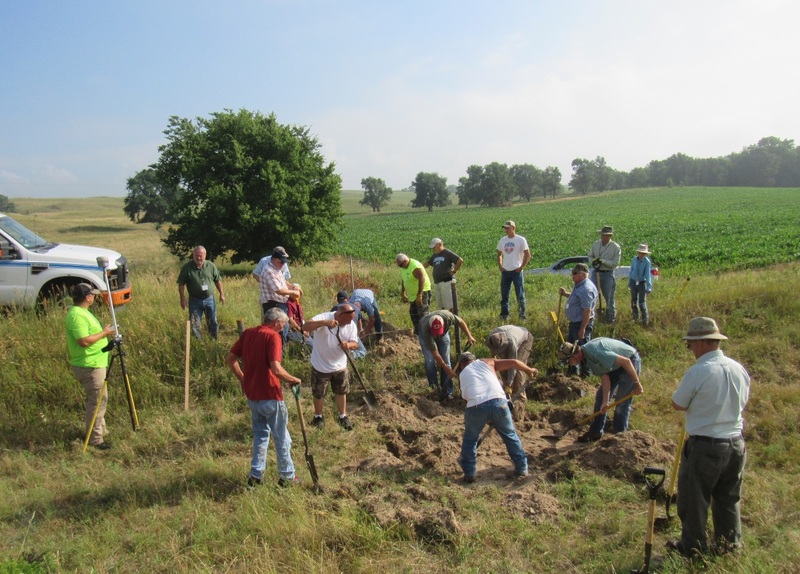 The general conclusion was that erosion, cattle, and the passage of 124 years had removed the limestone, tin cans, and lime cores that were being sought. 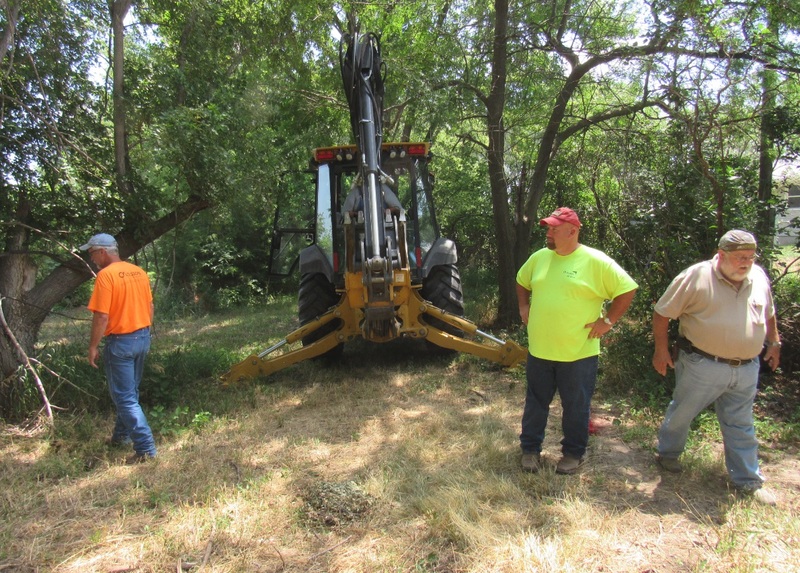 The other group working further north fared better during their search for Harvey’s 3-Mile monument. 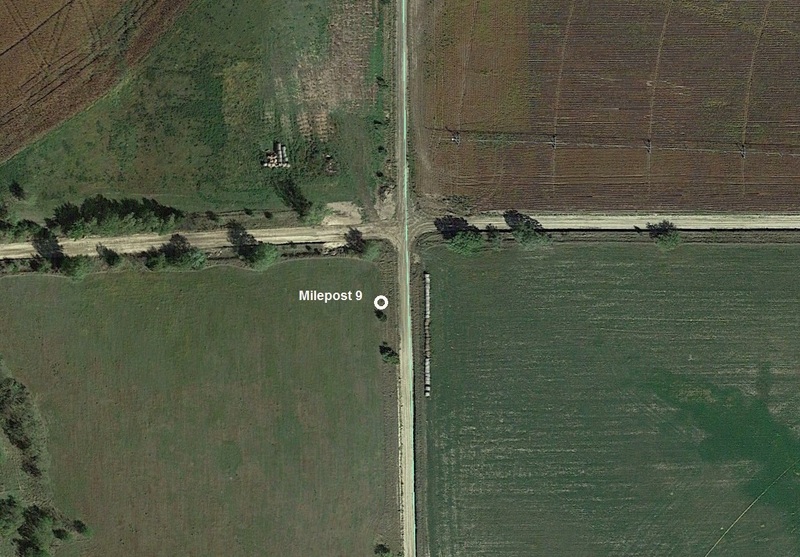 The calculated point placed it more than 100 feet east of the traveled road in a field. 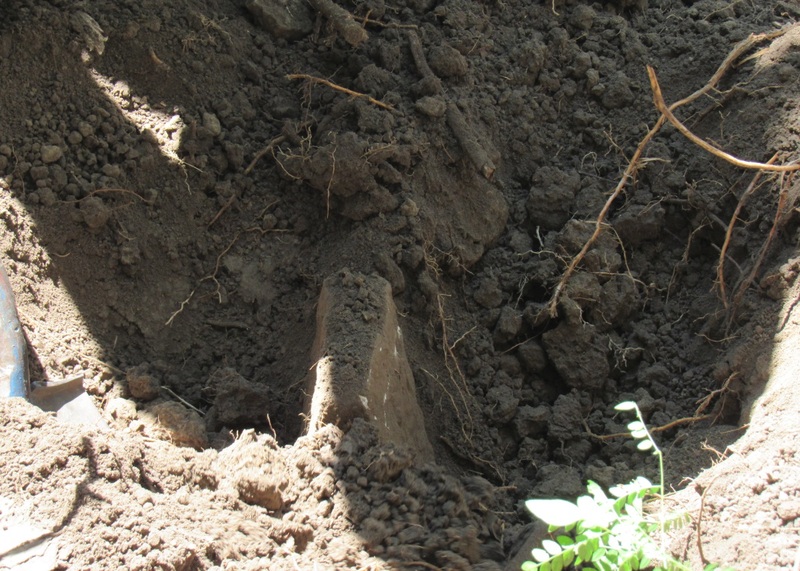 A large track hoe scraped away at the soil until the stone was found 6’ deep. On the south face was the number “3” and on the north face was the letter “M”. Joining in on the search was Mary Harvey from Chicago, the great-granddaughter of Robert Harvey. 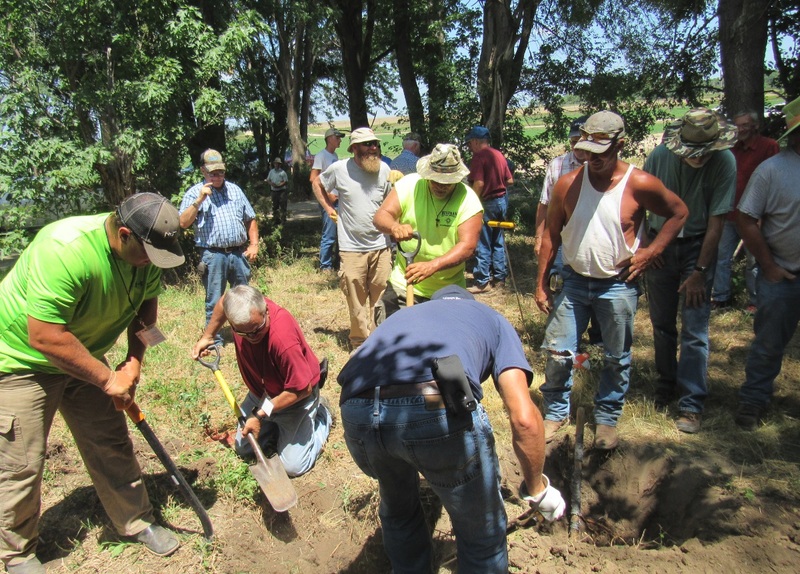 The two groups returned to the Civic Center for lunch and then collectively returned to the field to search for Robert Harvey’s 12-Mile monument on his meridian. This monument was calculated to be more than 250’ west of the traveled road and in the trees of an active farmyard. The family of this land was excited to have the group on their property and two of the children had a lemonade stand set up to refresh the group on the hot day. A very fortunate aspect of this search was having a utility locate beforehand. 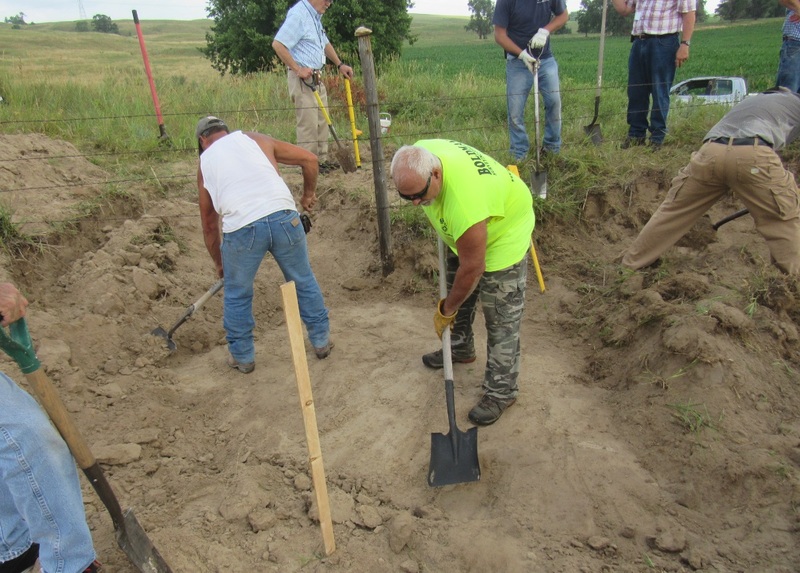 A buried power line crossed nearly exactly where Casey had calculated this monument’s position, so hand digging had to first determine the location and depth of the line before the backhoe could be used. Initial efforts to find the monument were unsuccessful, so an alternative location in the same area was staked out. 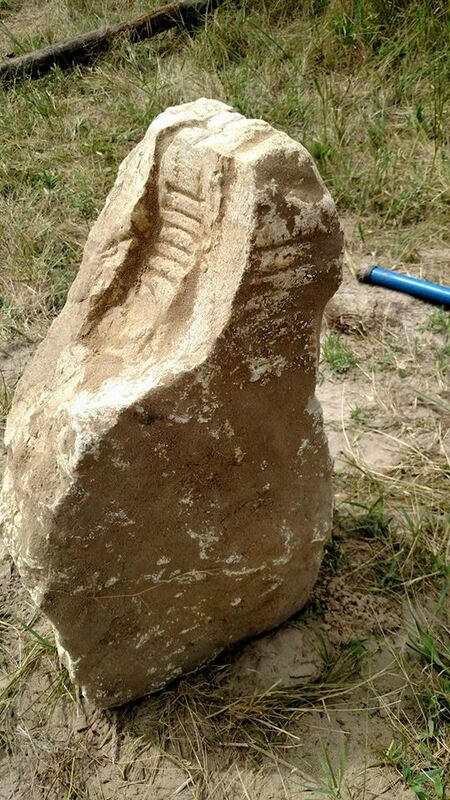 This location proved to be nearly right on and excitement quickly filled the area with the recovery of the stone that has the number “12” on the south face and the letter “M” on the north face. Feeling confident, the group then went to Harvey’s 9-Mile monument and searched by hand digging for that monument, but were unsuccessful. Everyone then returned to the Civic Center for homemade pie and ice cream. 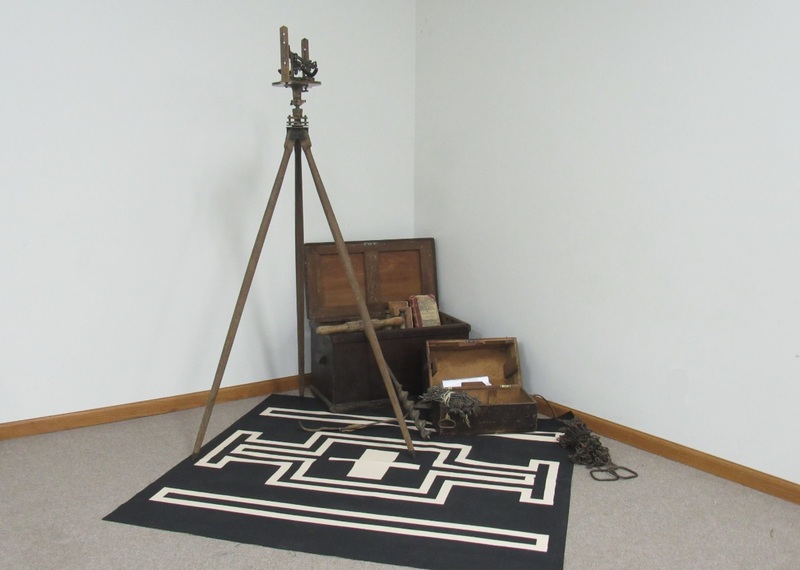 Individual photos were taken next to some of Robert Harvey’s survey equipment to reenact his famous pose from nearly a century ago. 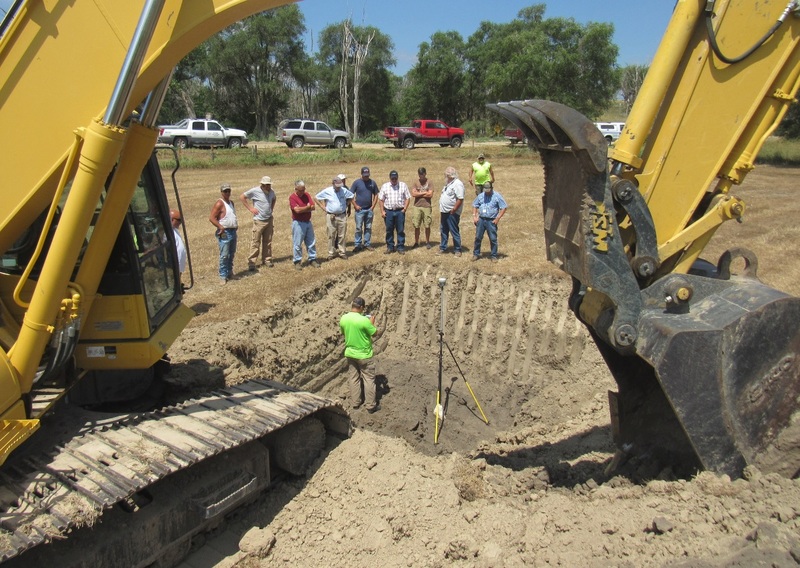 One week after the seminar, on July 21, a backhoe was brought to the 0 & 9 Mile sites for further excavation. 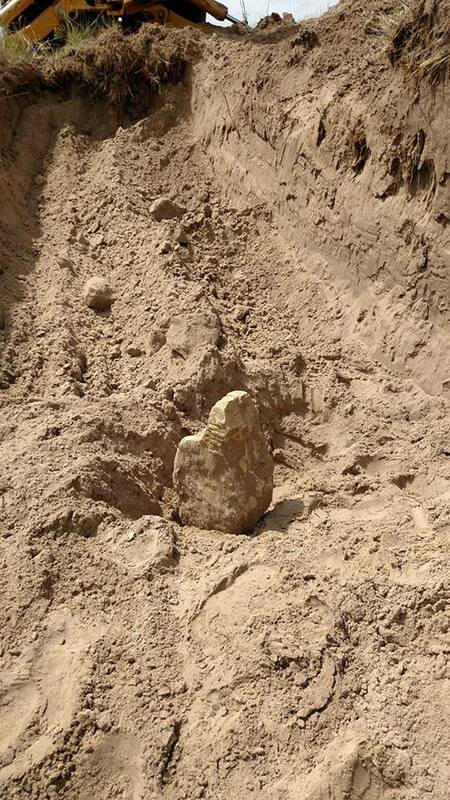 Nothing was found at the 9-Mile site, but the 0-Mile stone was recovered several feet deep and lying on its side northwest of where it was supposed to be. The trail road at this location has been built up, so the stone was likely moved out of position when the sides of the trail were pushed up. The red line is the boundary between Sherman and Howard counties. The focus of the seminar was along the south 12 miles of this 24-mile line. 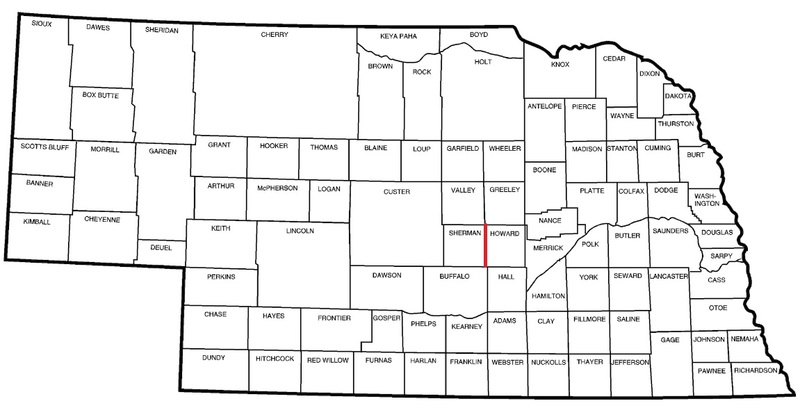 The starting point of Robert Harvey's meridian was on the 3rd Standard Parallel which was the corner common the Sherman and Howard counties and along the north side of Buffalo County. 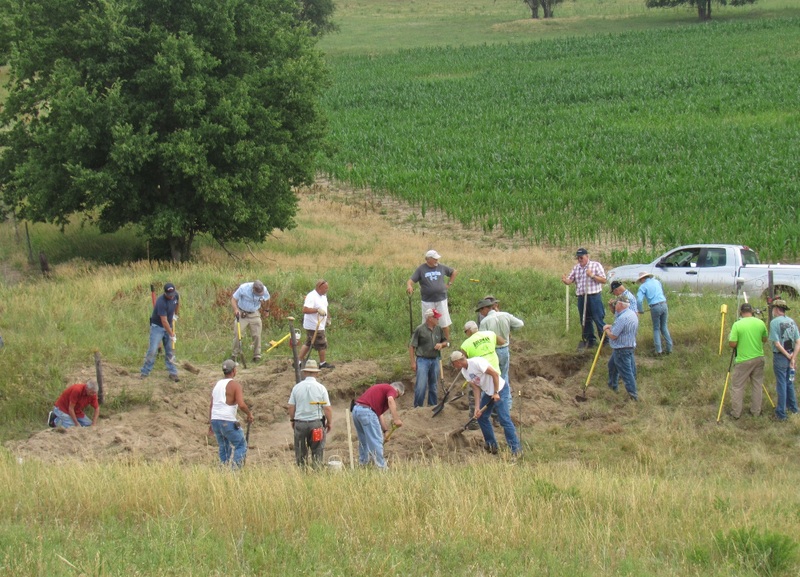 Digging begins at the 0-Mile location. 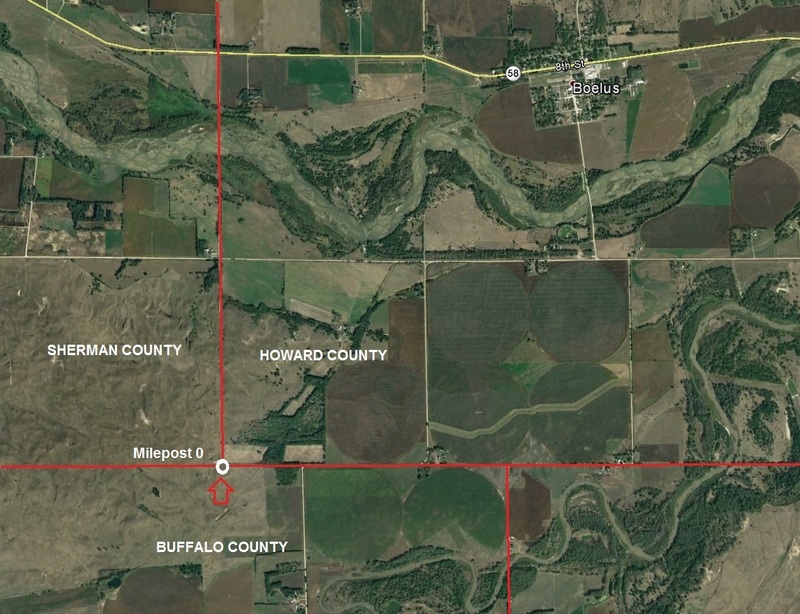 The search area at the 0-Mile location begins to expand. The outline of soil discoloration begins to appear. 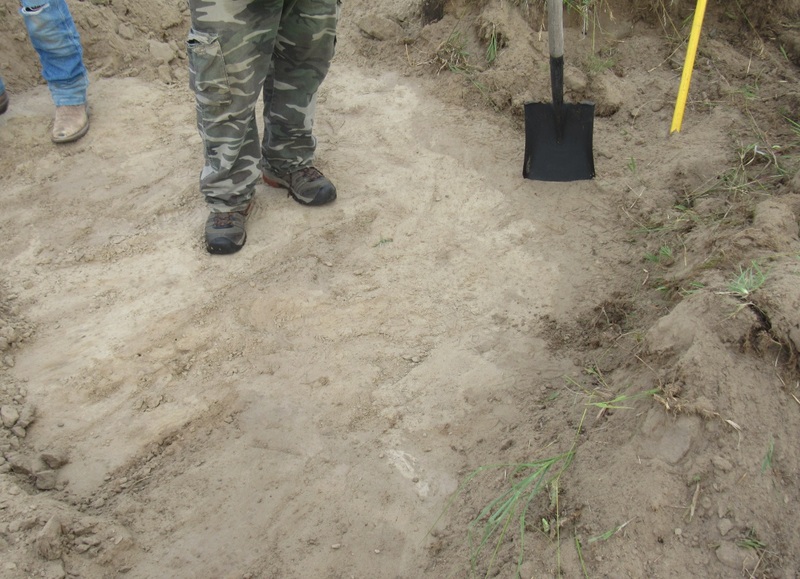 The area was greatly expanded to attempt to find the witness lime cores. Lighter colored soil is most likely the remains of Harvey's 1893 hole that was later filled in. 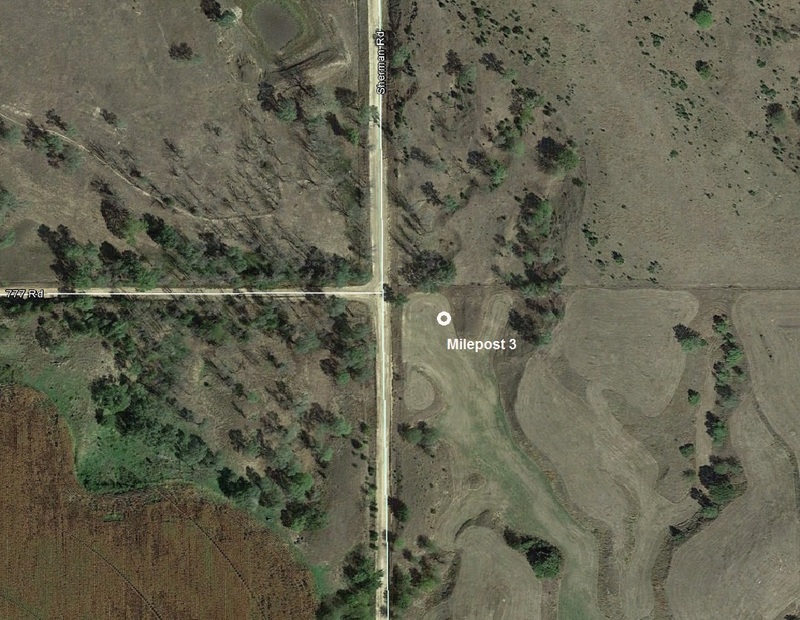 The white circle shows the location of Harvey's 3-Mile stone which was well east of the road. 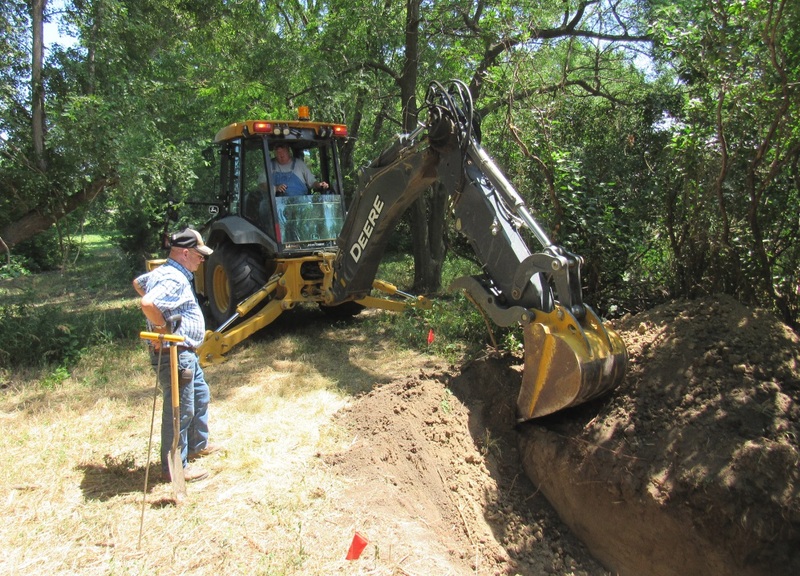 The track excavator provided much easier digging at the 3-Mile location. Harvey's monument on his meridian was found 6' deep. The faint numeral "3" was on the south face of the stone indicating 3 miles from the start of the meridian. Casey Sherlock obtains a position on the 3-Mile stone. The sideways letter "M" was visible on the north face of the 3-Mile stone. 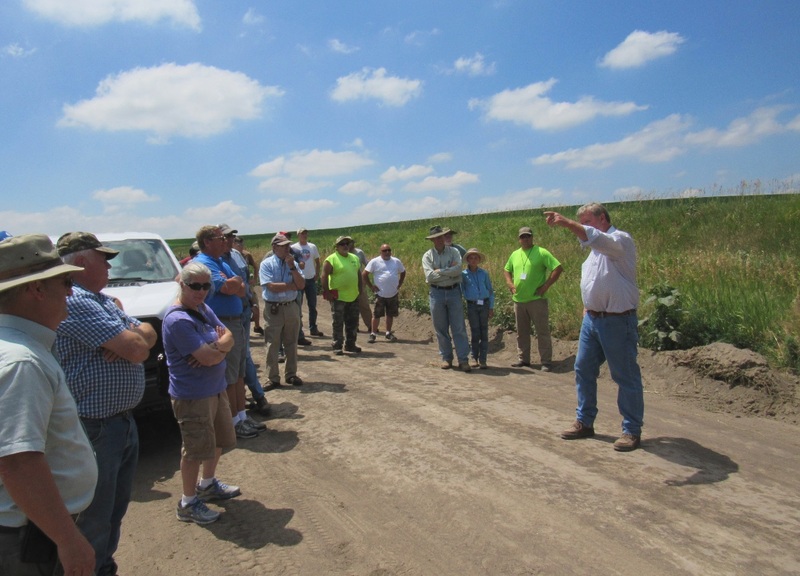 Tim Aitken describes how four different landowners each gave Robert Harvey different testimonies as to their recollection of the location of the lost corner at this spot in the 1890's. The location of the 12-Mile mark on Robert Harvey's meridian as indicated by the white circle was well west of the county line road. The backhoe is in place and ready to start digging. 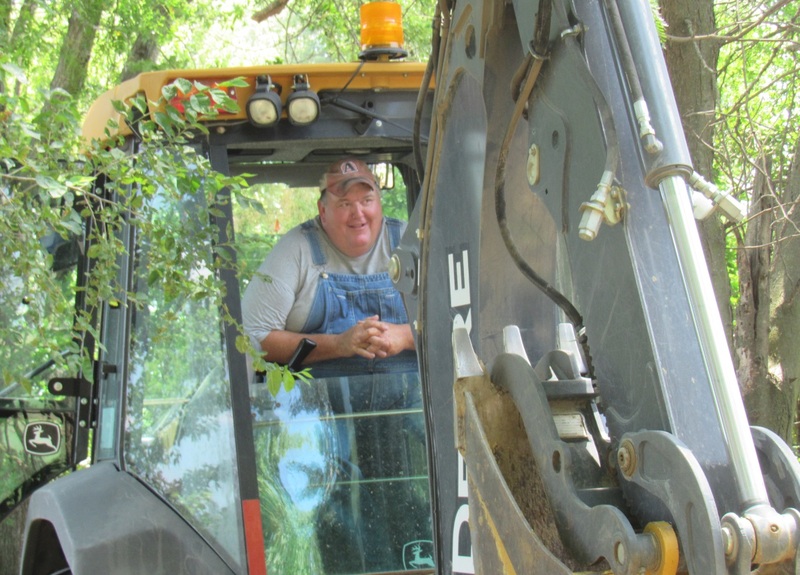 Tom, the backhoe operator for the County, was happy to assist. 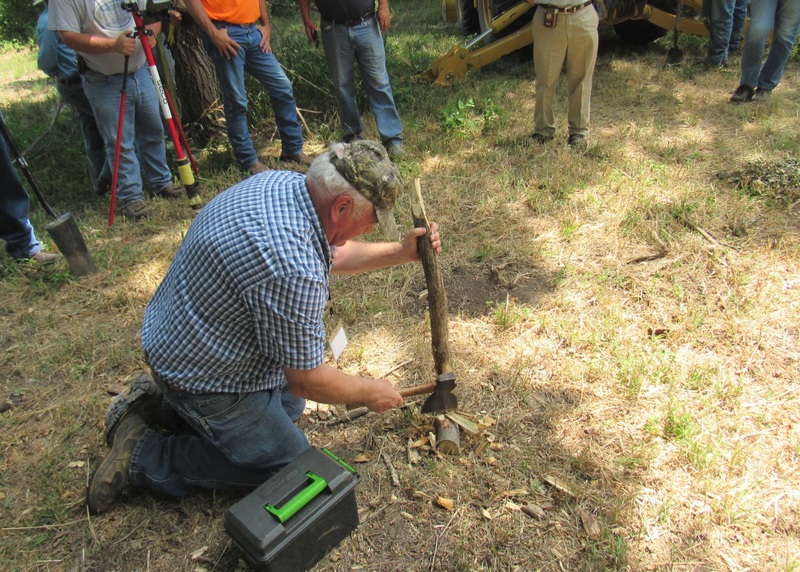 Gene Thomsen gives a demonstration on how the original GLO surveyors made the wooden stakes. 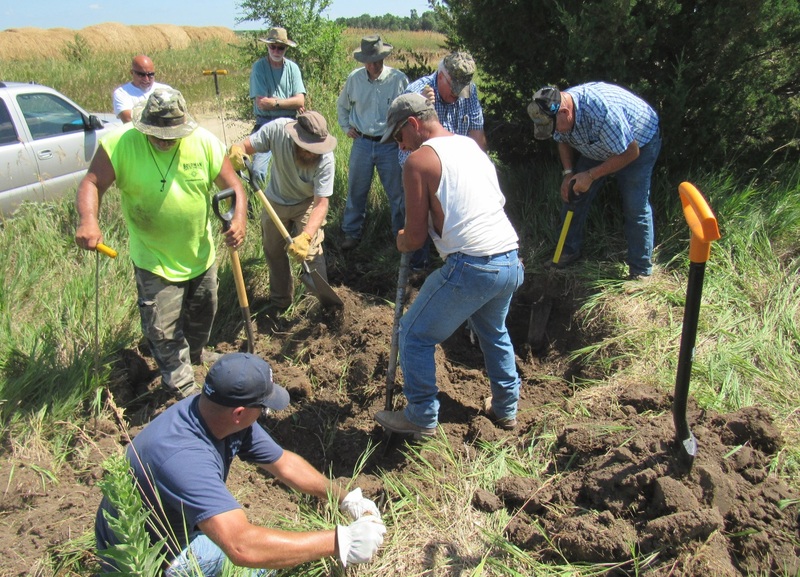 Digging is under way for the 12-Mile stone on Harvey's meridian line. Caution had to be made due to a buried power line right where we wanted to dig. The first glimpse of the 12-Mile stone. 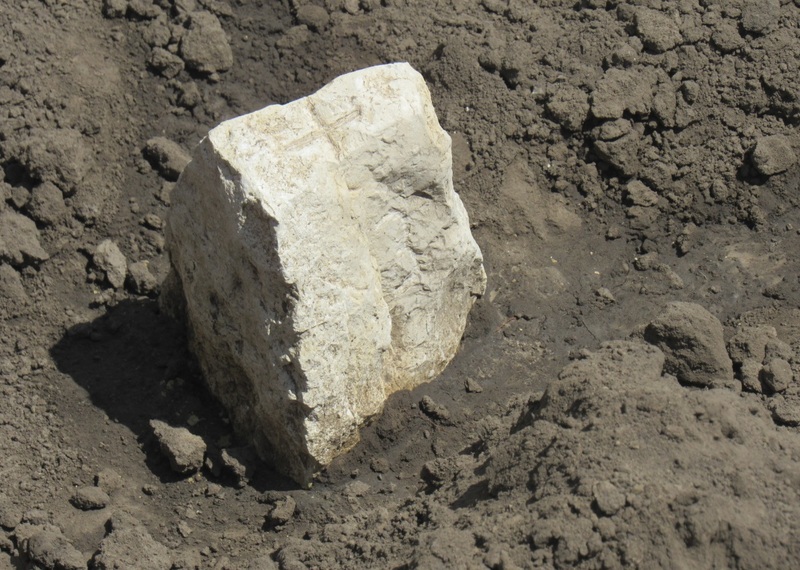 The top of Robert Harvey's stone that he placed at the 12-Mile location. 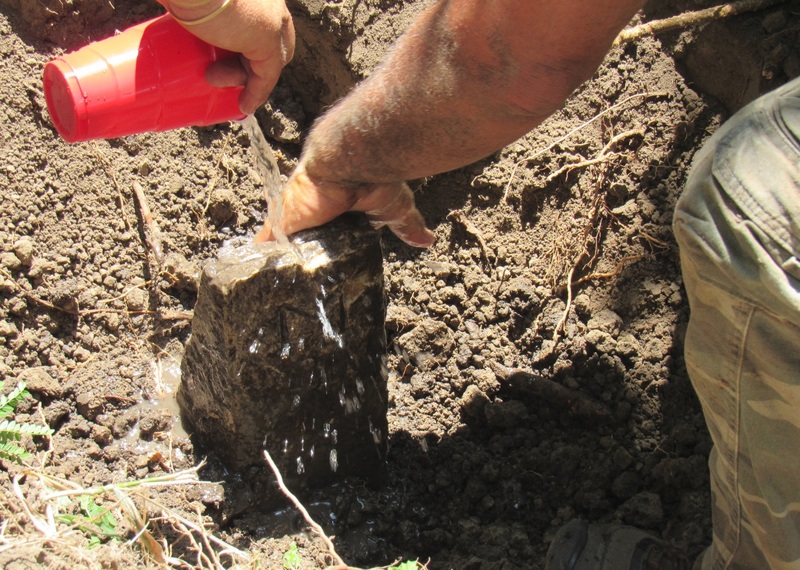 Washing the soil off the 12-Mile stone that was placed in 1893. 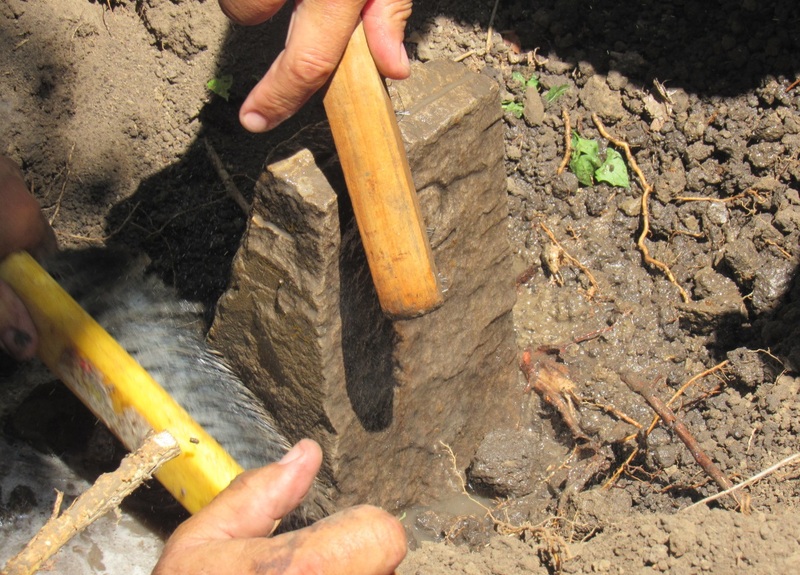 Scrubing with wire brushes helped to remove some of the 124 years of soil. 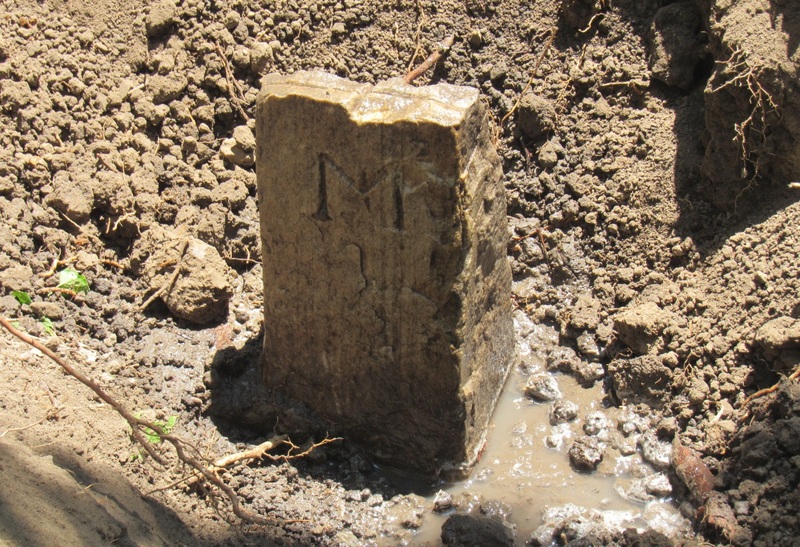 The letter "M" on the north side of the stone referring to "Mile". The numeral "12" indicating this was the 12-Mile location on Harvey's meridian. A group photo to celebrate finding Robert Harvey's 12-mile stone on his 1893 meridian. 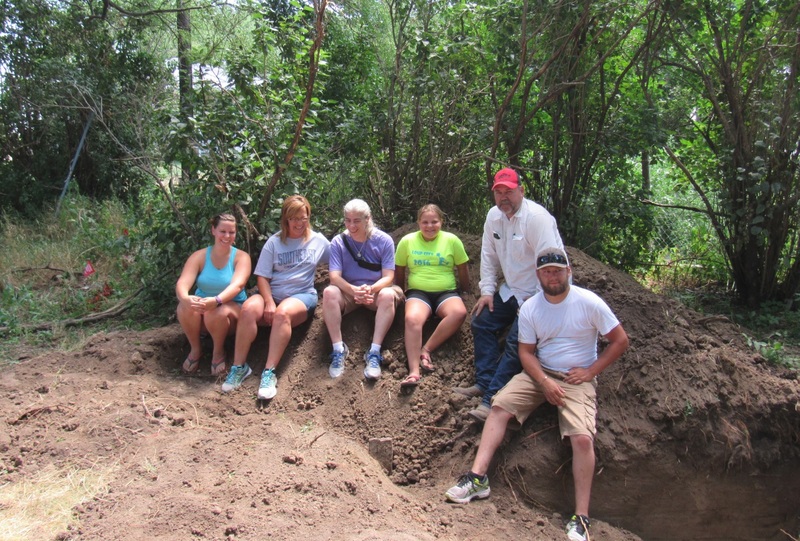 The family who own the farm pose with the stone that has literally been in their backyard. Mary Harvey, center in purple shirt, is the great-granddaughter of Robert Harvey. 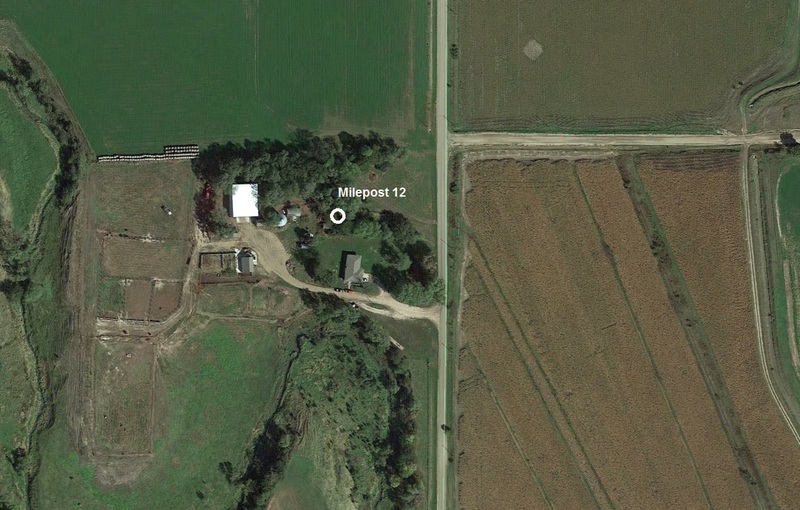 The white circle indicates the calculated location of Robert Harvey's 9-Mile stone location. 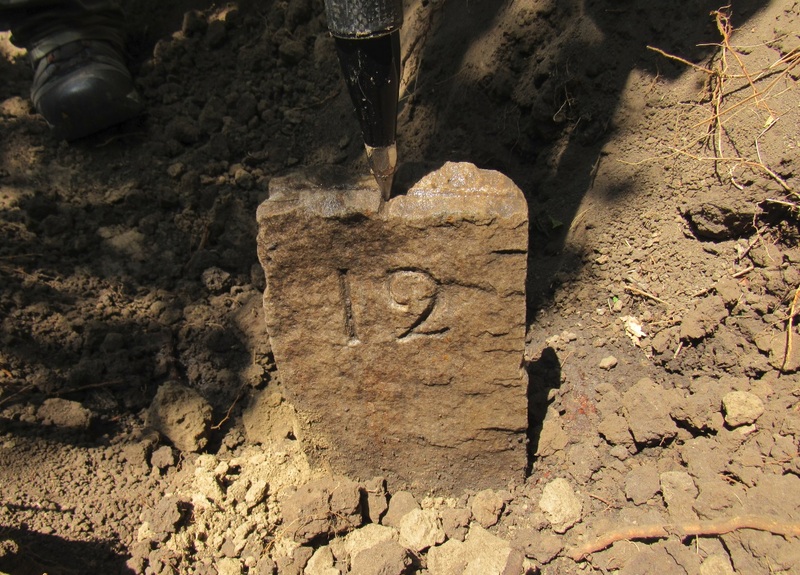 Eager to begin digging at the calculated location of the 9-Mile stone. A great effort was put forth, but the 9-Mile stone was not recovered. Vintage equipment set up to recreate Robert Harvey's famous photo from a century ago. 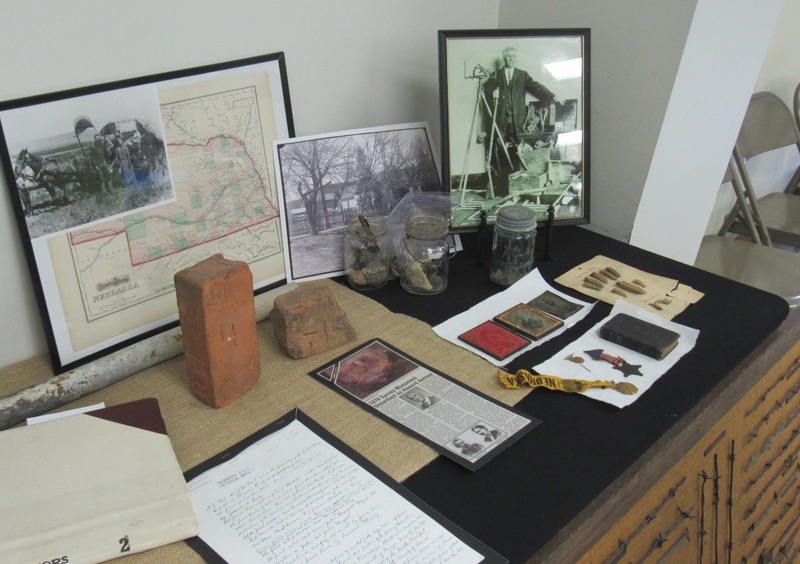 Items on display related to the days when Robert Harvey surveyed in this area. 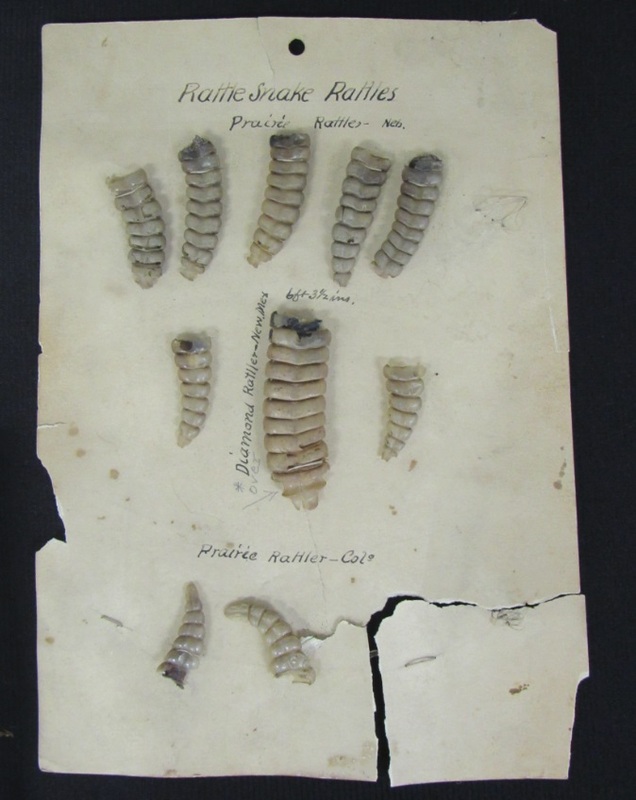 Rattles collected from rattlesnakes that Robert Harvey killed while surveying. 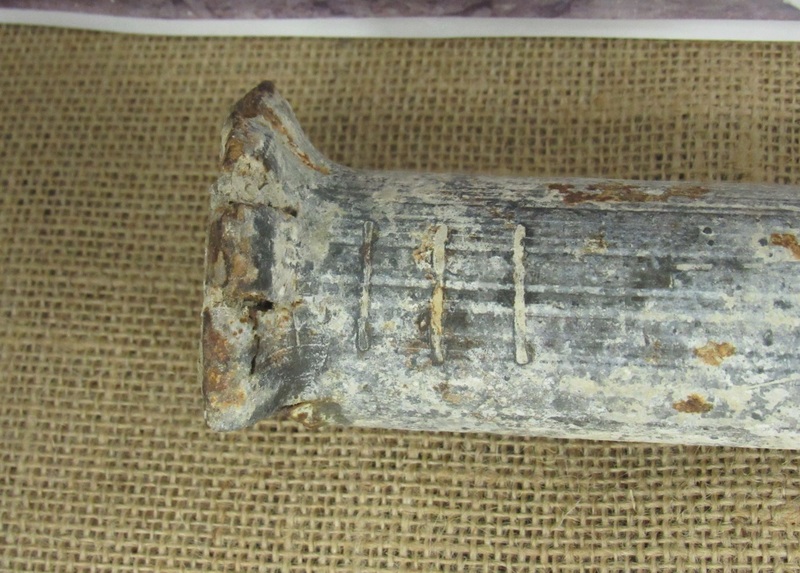 An iron pipe once used as one of Robert Harvey's monuments that shows notches. 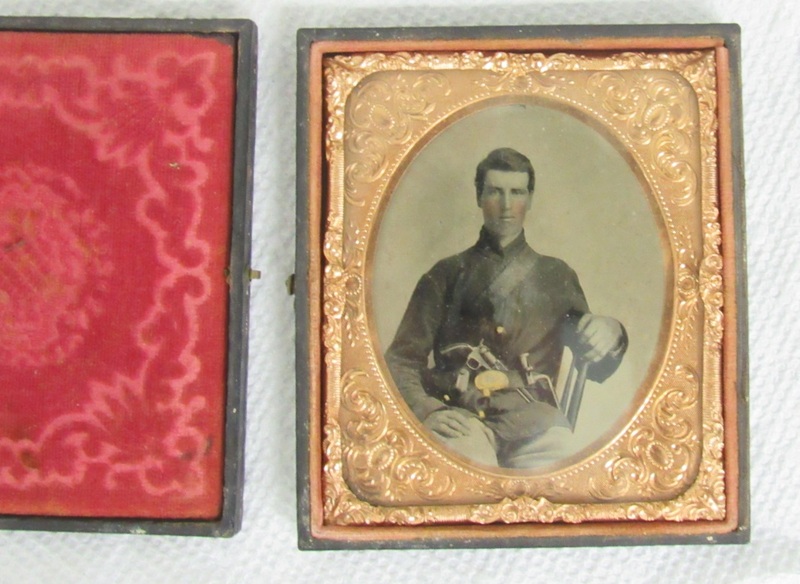 Robert Harvey's Civil War photograph when he served with the Company 'D' of the 74th Indiana Infantry. 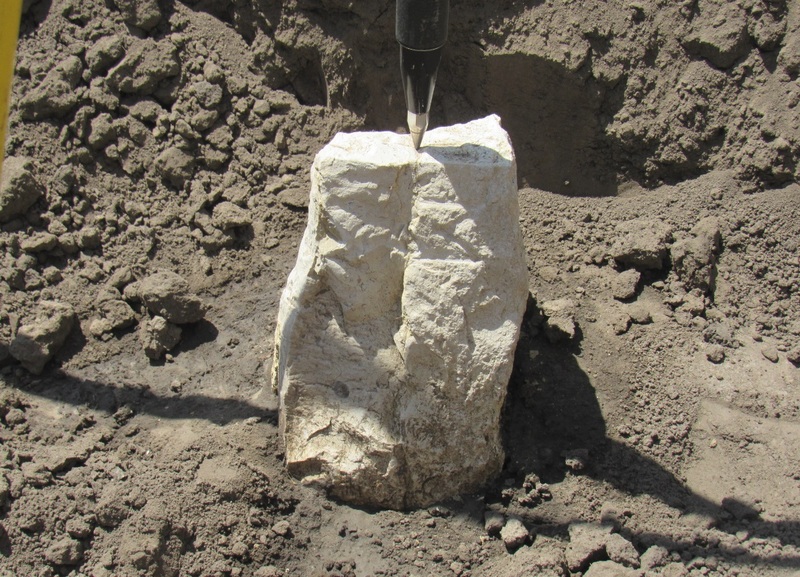 The recovered 0-Mile stone that was found with a backhoe one week after the seminar. The 0-Mile stone showing lines that it is at a township corner.